Long sleeve shirt made from crisp cotton poplin in a bright blue colourway. The KENZO shirt is cut with a casual fit and features a pointed collar, central button fastening and long sleeves with buttoned cuffs. 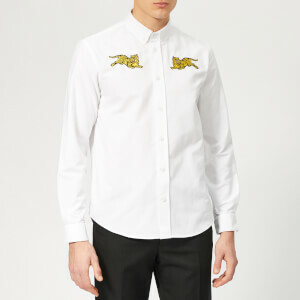 As a stamp of authenticity, the left chest is embroidered with the label's iconic tiger motif in contrast white threads. Finished with a straight yoke and rear box pleat. Slightly curved hem.